If we’re friends or even just Facebook friends, you have already heard the news. Although today was Littlest Man’s due date, he arrived early (even for his planned C-section date of the 17th) on February 12th at 6:55 a.m. weighing 7 lbs 10 oz, 18.75 inches. 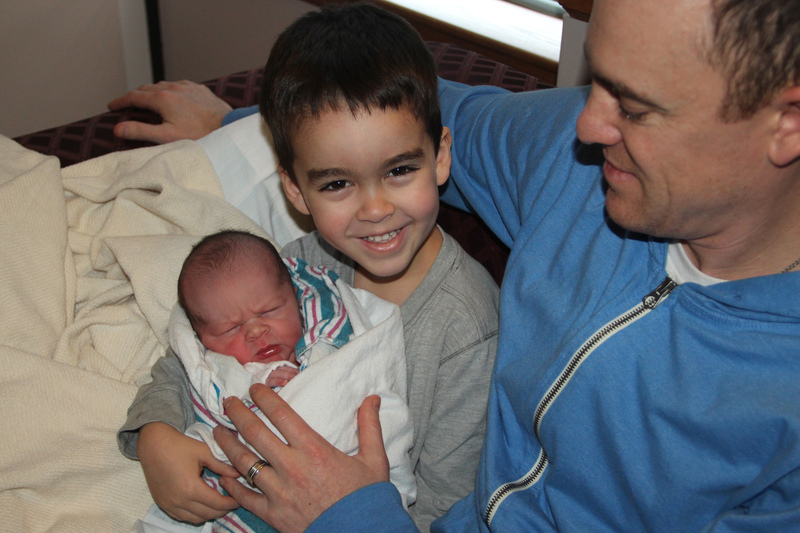 TINY in our household compared to his brothers (8.1lbs – on time – and 8.6lbs – delivered 1 week early). I can’t say that I was that surprised. I honestly kept thinking that he would come early, but I ignored my intuition and put all the plans in place for the 17th. I even put off all sorts of get-this-done-before-baby-arrives projects that nagged at me while I was in the hospital. We actually went to the hospital on Sunday the 9th and spent a few hours getting checked out because I had all the signs of preeclampsia, but it turned out that I had all the symptoms, but nothing was “wrong” on all the tests and the baby was fine. Being 38 weeks, we headed back home again planning that we had a full week until we’d be back. Still, in the back of my mind, I thought I wouldn’t make it until the 17th. Chris was exhausted the night of the 11th and went to bed before me. I remember thinking, “I will not be surprised if my water breaks tonight since my house is a mess” as I climbed into bed. Sure enough, I was asleep all of an hour when my water broke at midnight. We quickly called my mom to come watch the boys and then called Chris’ parents to let them know we’d be having a baby within 24 hours. It took about an hour for Mom to arrive and for us to be ready to head to the hospital, and with the boys all asleep, we headed out. 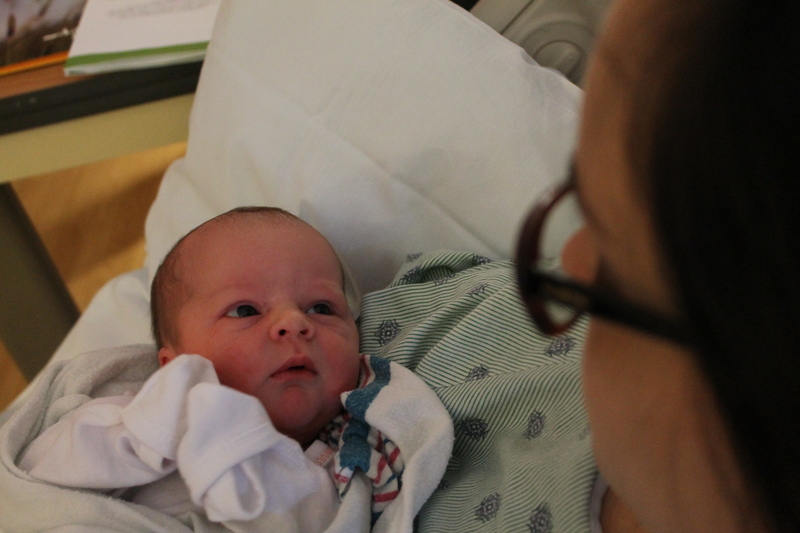 Once we arrived, they determined that I was not in active labor so we could wait for a C-section as planned. Peggy and the doctor she was assisting decided on 6 a.m. and so we tried to get a few hours of sleep. At 5:15, with 45 minutes to go, I lost it. I mean, completely lost it. Sheer panic type of lost it. I had already been through 2 C-sections and had 3 kids at home, you would think I’d be totally cool, but oh, I was not. I was ready to run out of the hospital. As thoughts of how they might be able to sedate me started running though my mind, Chris being the amazing husband that he is, calmly came to the bed and started rubbing my feet. I passed out within about one minute. 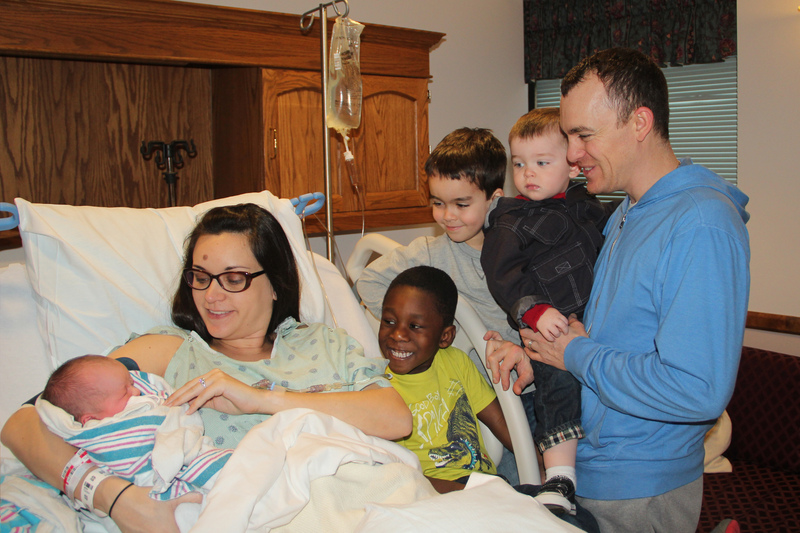 When I woke up, Peggy was entering the room at 6:15, all smiles and ready to deliver our baby. I was wheeled to the operating room and Chris waited outside while everything was prepped. He then came in and stood by me as our littlest man arrived. He arrived screaming and didn’t stop for a good 10 minutes, even after being put on my chest. After being wheeled back to our room, we spent a little time bonding and then allowed Great Grandma Lou and Grandma Cupcake to come meet him. We had wanted to wait for the boys to meet their brother first, but he arrived so early that they were still at home just starting to eat breakfast. 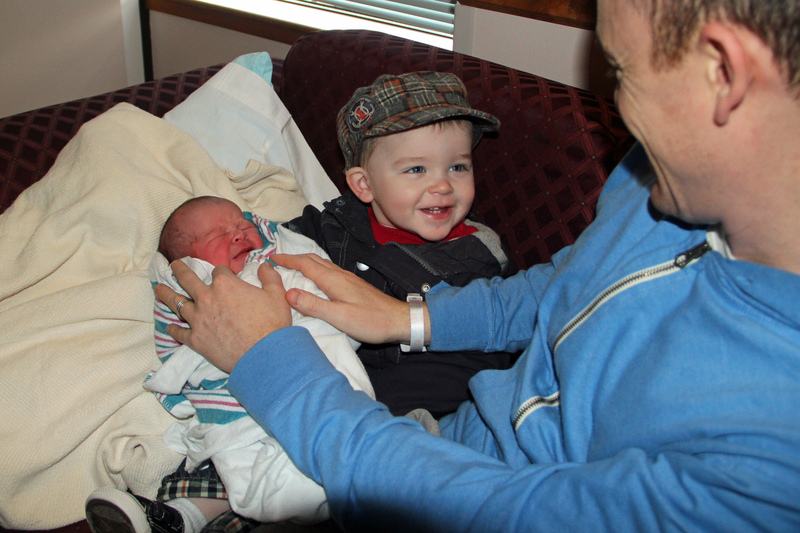 When they arrived later, they were just precious with their new baby, all taking turns to hold him. At this point you might be wondering, what DID they name him? Well, he does have a name, but it took us a full 12 hours or so to decide. We normally keep it a secret until the decision is made, but we were so torn, we even had nurses voting on a white board in our room. We wanted a “K” name since we had two “C”s and one “K” and it needed to be a last name since all his brothers had last names used as first names. We narrowed it down to Kruse, Kacen, and Kacher. We also always pick something important to us for a middle name so, we started there. We decided on using Daddy’s name of Christopher for the important middle name. The problem was, none of the names we liked sounded good with such a long middle name so, we moved it to the first name. Although we were leaning towards the other two names simply because we liked them, this little guy just wasn’t a Kruse or Kacen to us. He had a little bite to his personality that Kacher just seemed to better fit. When Uncle Nick arrived to meet him in the evening (a strong advocate for “Kacen” early on) and even he thought Kacher was a better fit, we knew we had found the match. Christopher Kacher was finally named. So, technically we now have 3 “C”s and “K”, but Kacher will go by his middle name so… what can I say. He is the 4th. We broke all the rules which suits his personality thus far. 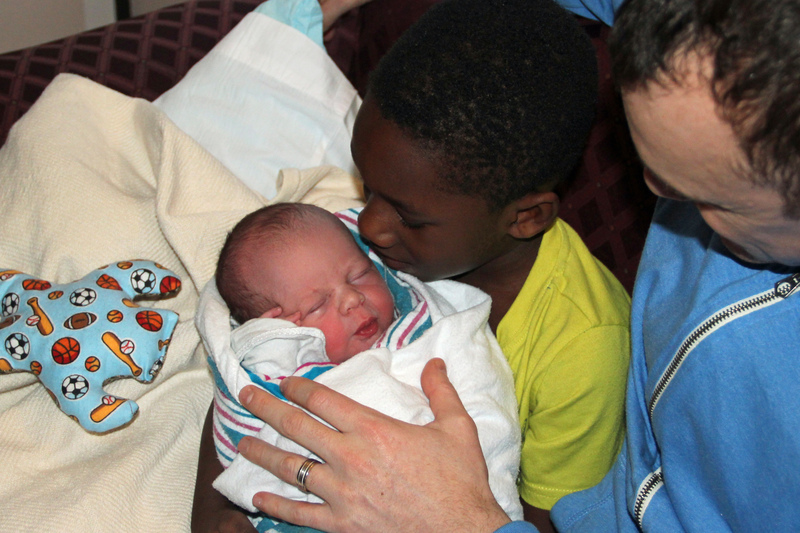 Congratulations on your beautiful addition to your family! Glad that everyone is healthy and doing great. Such a perfect addition to the family!